Human Services Center, with the help of St. Vincent De Paul, St. John Maronite, New Hope Wesleyan, and Two Fat Guys and an Oven were able to provide over 100 children with presents from their wish list!! 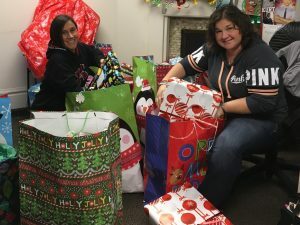 Alicia Craig and Amy Rispoli coordinated the effort and with the help of case managers, made wishes come true. In addition to the help from the community, a consumer from years ago reached out with a monetary donation to “pay it forward” as she remembered the help that was given to her in a time of need. Thank You to all of those who took time to participate and give back to the community!